Home is my sacred place, so the thought of having none is horrifying. And yet daily the news rolls in about layoffs, foreclosures, medical bankruptcies, tornadoes in the Midwest, a typhoon in the Philippines, and refugee camps in the Middle East. The reasons are legion, but the loss of home is happening everywhere, all the time, and perhaps more often each day. “Not me,” we think privately. “It would never happen to me.” But what if? Now 69 years old, Richard has been writing ever since he heard the first poem in his mind back in 1973. Kind of a poet troubador, he has since written as he traveled all over the country, spending time in every state except Hawaii. He reads his work every Sunday at 1:00 at Whoo’s Donuts at 851 Cerrillos Road. He is in the process of collecting his poems in three books: A Searcher Seeking Something New, You Think You Don’t Like Poetry?, and Volume I of the Aquarian Psalms. He says 100 people have already committed to buy copies of all three. Some people are just born for the road, and Richard is one of them. Nevertheless, he has settled periodically, as in the 14 years he spent in Las Vegas. There he had several businesses, including one dedicated to drawing some of his work on a rock called picture sandstone. For example, one said “Please turn me over.” Then “Boy are you easy” appeared on the other side. He sold 19,000 of such rocks. For three years, he was also the “corporate poet,” as he put it, for a recreational vehicle company. 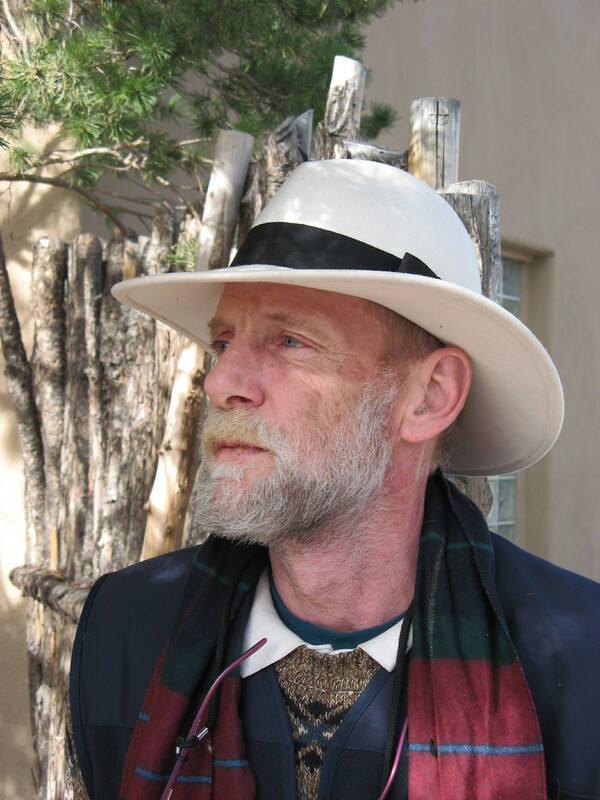 For nine years before arriving in Santa Fe, Richard lived in a truck and a car, meeting “marvelous” people everywhere he went. He has a number of health problems including peripheral vascular disease, a hernia, skin cancer, and the need for some bottom teeth. As soon as he gets a housing voucher, which will happen shortly, he will begin to address some of these issues. When he recites his poetry, Richard’s face is full of light. There are many memorable lines in his work, many acute observations, much to be enjoyed and understood by those who have learned some of the same things on a very different journey through life. One senses that Richard Boscon is at a place of arrival. When I interviewed Nick Timbrell, however, my impression was that of a man who has unfinished business with his potential. Nick is a very different story, a British citizen who recently began applying for citizenship after living 31 years in the United States. Trim and athletic with an innate sense of style, he was born in Bath 55 years ago to a father who was a diplomat in the Foreign Office and a mother who was a teacher, artist, and Shakespearean scholar. He traveled internationally as a member of one of the premier rugby teams. “A game of poetry,” he says when played beautifully, but one that has also broken nearly every bone in his body. Educated at Oxford, he came to the United States to do graduate work in architecture and restoration at Cornell. His marriage to an American woman came to an end there, and his career thereafter was divided among a variety of interests. These included restoration work, which he did for 14 years (including on the Wesleyan Chapel), architecture, design, and the teaching of art and mathematics. He is helping Richard with the design of his books. Nick laughs that he has the potential to become a “screaming intellectual,” and one can see that in the way his conversation travels through territory that is both philosophical and spiritual. He came to Santa Fe to paint, and one example of his work hangs in the Shelter cafeteria. He also continued to be involved with restoration and has become an acute observer of the culture here and of how we respond to the architectural environment. As a result of having hurt his back and run out of money, as he puts it, Nick is now personally aware of how interiors could be better designed to meet the needs of the homeless, to help them get back on their feet. I suggested that he develop that concept further, imagining narrative or drafting or both, and believing that he could present it effectively to any philanthropist in Santa Fe. If he does pursue this project, what a great story it would make for the newspapers. Nick commented at one point in the interview that “The world is created by art, which great scientists observe and describe.” It therefore follows in his own mind that design needs to be applied to all disciplines. That makes one think, doesn’t it? Nick Timbrell has a way of doing that. Unfortunately, as of a day after our meeting, something new–a diagnosis of thyroid cancer–is much on his own mind. Who knows how the lives of these two thoughtful men will evolve, but one is glad for the respite they have found at St. Elizabeth. Nick describes it as a place of great intelligence and compassion. There is clear evidence in both Nick and Richard that it intervenes effectively in lives that, although worthwhile, have not found security through conventional routes. With even those conventional routes more frequently at risk, we may need significantly to expand provisions for such refuge. Just a thought. Thanks for these. These two men challenge any comfortable generalizations we might like to make about homeless folks and why we could never possibly be in their shoes.